Whole cell lysate from mock transfected or SMC2 transfected HEK293T cells. Our Abpromise guarantee covers the use of ab10411 in the following tested applications. WB 1/1000 - 1/10000. Detects a band of approximately 140 kDa (predicted molecular weight: 137 kDa). Belongs to the SMC family. SMC2 subfamily. The hinge domain, which separates the large intramolecular coiled coil regions, allows the heterodimerization with SMC4, forming a V-shaped heterodimer. Nucleus. Cytoplasm. Chromosome. In interphase cells, the majority of the condensin complex is found in the cytoplasm, while a minority of the complex is associated with chromatin. A subpopulation of the complex however remains associated with chromosome foci in interphase cells. During mitosis, most of the condensin complex is associated with the chromatin. At the onset of prophase, the regulatory subunits of the complex are phosphorylated by CDC2, leading to condensin's association with chromosome arms and to chromosome condensation. Dissociation from chromosomes is observed in late telophase. 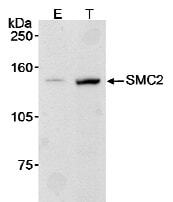 ab10411 detection of human SMC2 by Western blot. Samples: Whole cell lysate (90 µg) from mock transfected (E) or SMC2 transfected (T) HEK293T cells. Antibody: ab10411 used at 0.1 µg/ml. Detection: Chemiluminescence with a 10 minute exposure. ab10411 has not yet been referenced specifically in any publications. Publishing research using ab10411? Please let us know so that we can cite the reference in this datasheet.